Well played, well played all around. Give yourselves a hand, birders. Though it took a little prodding on Facebook several of you found the intestinal fortitude to risk looking foolish and being mocked by guessing the answers to the Diabolical Fall Migration Quiz. Surprisingly, though at least one quiz-taker thought the quiz was indeed diabolical, the first person to guess, John of A DC Birding Blog, managed to get three out of four correct, missing only the identity of the first quiz pic. Nick of Biological Ramblings, the second guesser, managed to get the first picture correct but then threw out one of John’s correct answers, so he also managed to get three out of four. Nate of The Drinking Bird and Jason of Brewster’s Linnet both got the first pic wrong in the same way and also each tossed out one of John’s correct answers but still managed a respectable fifty percent correct. Ali, who does not yet have a blog, but does have some pretty sweet images on Flickr, was wise enough to stick with John’s original three correct answers and knew enough to know that he didn’t know what the first image was. So, with Ali getting three correct answers and no incorrect answers, and John getting three right despite the handicap of being the first to guess, I declare a tie for the winner of the Diabolical Fall Migration Quiz. As soon as I receive entry fees of $500 from each winner I will package up their prizes and ship them. On to the answers! The first quiz picture was a stumper for most of you, with Swainson’s Thrush, Ovenbird, and Rose-breasted Grosbeak among the contenders, along with Ali’s wise (but not very brave) “No idea.” The bird is, as Nick guessed, a Rose-breasted Grosbeak, and look at the whole image below will give you an idea as to why I cropped just a small portion to use in a quiz. Darned shadows! The second quiz picture was, I think, not quite diabolical enough. The throat streaking was just too obvious a field mark and every single guesser correctly surmised that they were looking at a Northern Waterthrush. Next time I use this species I will make sure to not include the throat in the image. I am amazed that over half of you managed to correctly identify the bird in the third quiz picture. I did not think this one would be identifiable but I once again managed to underestimate the readers of 10,000 Birds. 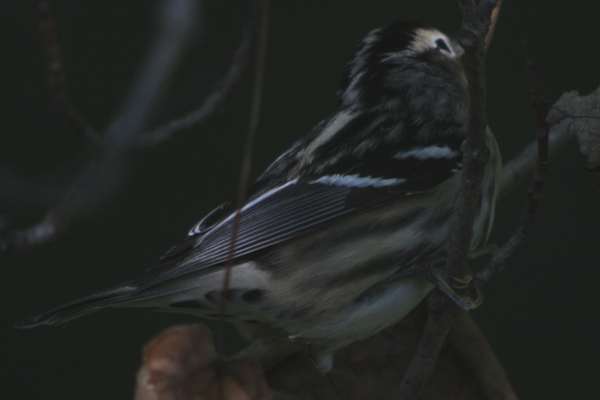 It is a Black-and-white Warbler, as John, Jason, and Ali figured out and is neither a Black-capped Chickadee nor a Slate-colored Junco. 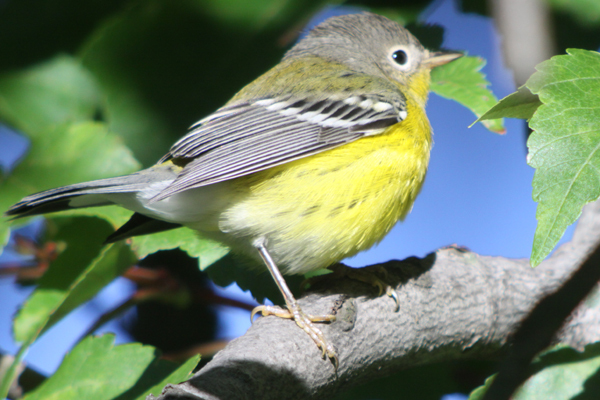 The bird in the fourth quiz picture is a Magnolia Warbler, as everyone but Jason guessed (though, in his defense, he did say he guessed Blue-winged Warbler “just to be different”). When making this quiz I debated whether or not I should leave a touch of yellow in the lower right corner of the image or crop it out, but I thought without the yellow it would be completely impossible. Next time, like with the Northern Waterthrush‘s throat streaks, the yellow of the Magnolia Warbler will be left on the cutting-room floor. Thanks to everyone who was brave enough to guess and, as for the rest of you, I hereby hex you. No lifers for you! 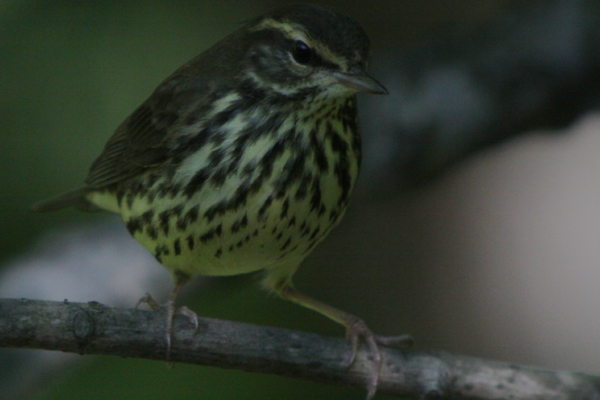 Some thrushes have a similar throat pattern to the Northern Waterthrush, so leaving in a bit of the throat doesn’t make it completely obvious. Rose-breasted Grosbeak never occurred to me. 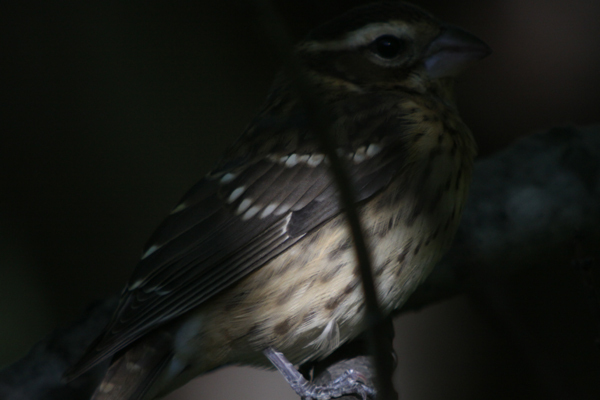 When Nick said Rose-breasted Grosbeak I knew it was correct, but I thought it was bad form to rip off three of the four answers for my own guess. @John: Still, no throat for you! @Nate: Uh-huh. And have I ever got a bridge for you!